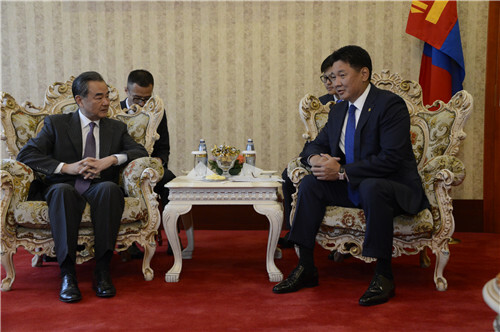 On August 25, 2018, Prime Minister Ukhnaagiin Khürelsükh of Mongolia met with State Councilor and Foreign Minister Wang Yi at Ikh Tenger Complex in Ulaanbaatar. Ukhnaagiin Khürelsükh asked Wang Yi to convey his greetings to Premier Li Keqiang. Ukhnaagiin Khürelsükh expressed that Mongolia and China are everlasting neighboring countries and comprehensive strategic partners. China-Mongolia relations have enjoyed smooth development recently, and have become a model of friendly coexistence for neighboring countries. Mongolia firmly adheres to the one-China policy and insists that Taiwan and Xi Zang are inalienable parts of China. Taiwan-related and Xi Zang-related affairs are China's internal affairs. There are no political, economic, territorial, or religious issues between Mongolia and China. The two countries enjoy great potential and broad prospects for cooperation. The Mongolian side is committed to promoting the integration of the Development Road Initiative and the Belt and Road Initiative, and hopes to deepen cooperation with the Chinese side in such fields as agriculture, animal husbandry, energy, and infrastructure construction, so as to elevate the level of cooperation between the two countries. The Mongolian side sincerely thanks the Chinese side for its support and assistance to Mongolia's development and people's livelihood for many years, and highly appreciates the Chinese side's support for the construction of a wastewater treatment plant in Ulaanbaatar, which will make important contributions to improving the ecological environment of Ulaanbaatar City and the quality of life of the Mongolian people. The year of 2019 marks the 70th anniversary of the establishment of diplomatic relations between Mongolia and China. It is hoped that the two sides will take it as an opportunity to sum up the development progress of bilateral relations, map out a new blueprint for future cooperation, and make joint efforts to elevate bilateral relations to new highs. Wang Yi conveyed Premier Li Keqiang's sincere greetings to Ukhnaagiin Khürelsükh. Wang Yi said that China and Mongolia are friendly neighboring countries connected by mountains and rivers, and that strengthening the all-round cooperation and deepening the comprehensive strategic partnership between the two countries is the only right choice for the two sides. The Chinese side respects the independence, sovereignty and territorial integrity of Mongolia, and appreciates the Mongolian side's adherence to the one-China policy and its confirmation that it will always support each other on issues concerning respective core interests with the Chinese side. As long as China and Mongolia establish strong political mutual trust, bilateral relations will develop in a rapid and healthy manner. The Chinese side appreciates the Mongolian side's active response to and support for the Belt and Road Initiative, and is willing to work with the Mongolian side to formulate a cooperation outline on the basis of the memorandum of understanding on cooperation signed by the two countries, and promote the implementation of more projects at an early date. The Chinese side is willing to help the Mongolian side translate its resource endowments into development advantages, improve independent development capabilities, achieve diversified economic development and effectively improve people's livelihood in the process of the joint construction of the Belt and Road Initiative. The two sides should make joint efforts to accelerate the process of negotiating and signing a bilateral free trade agreement and strive for an early realization of bilateral trade exceeding 10 billion US dollars and personnel exchanges hitting 3 million person-times per year. The Chinese side is willing to work with the Mongolian side to seize the important opportunity of the 70th anniversary of the establishment of diplomatic relations between the two countries next year that inherits the past and ushers the future to cement exchanges at all levels, deepen cooperation in various fields, and enhance communication on state governance and administration, so as to push China-Mongolia comprehensive strategic partnership for constant and new progress and benefit the two peoples. 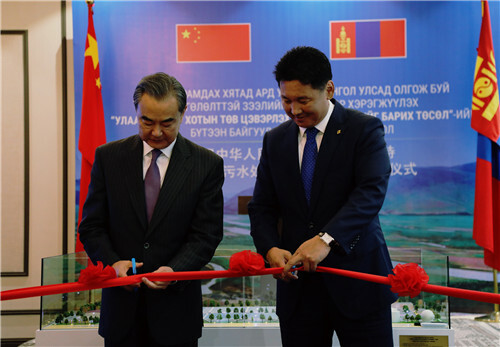 On the same day, Wang Yi and Ukhnaagiin Khürelsükh also jointly attended the launching ceremony of construction of a wastewater treatment plant in Ulaanbaatar. Wang Yi and Minister of Foreign Affairs Damdin Tsogtbaatar of Mongolia jointly inspected a special lane to enhance customs clearance facilitation under the Belt and Road Initiative at the Chinggis Khaan International Airport in Ulaanbaatar.